It was tree day here at the homestead. 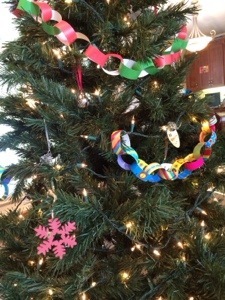 I roll the light strings up on cardboard every year, and I had the boys help by holding them. 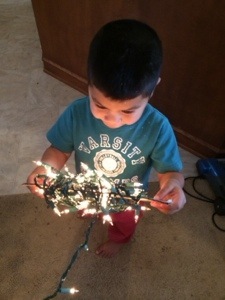 Elias was already holding his when I plugged it in, and I think he lit up as much as the string. The red and green chain on the tree is counting down the days to Christmas, and the multicolor one is for the days to seeing all the Gasser cousins. 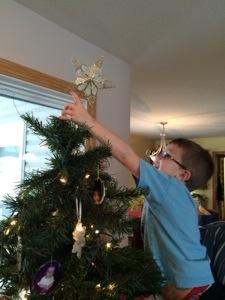 We’ve had bad experiences with tree stability in relation to little boys, so the tree is anchored to the window. I was telling one of my clients – based in San Francisco – about this, and she said, “Oh, we do the same thing! For earthquakes.” I can definitely see the similarities. But the tree is one of my favorite things about Christmas, and my favorite thing about the tree is the ornament collection of the boys’ pictures. 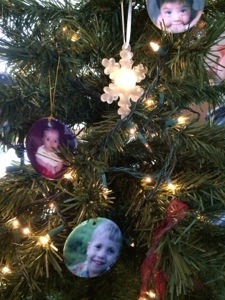 Every year, I pick a picture for each of them and get it reproduced on a ceramic ornament. I love pulling out the ornaments from past years. Right now they’re all clustered together at the top of the tree. As years go by, we may actually need a dedicated face tree.